While walking around Whole Foods with the sous chef, I was trying to think of an idea for tonight’s grilled cheese. I had thought broccoli but quickly dismissed that. I thought potatoes, but was unsure of my choices other than potato chips. 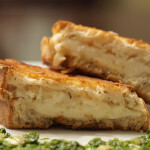 That is when the sous chef suggested mashed potatoes on a grilled cheese, which I thought was a great idea. Maybe we could add some scallions or onions. That idea was quickly overruled when we saw, at the prepared foods department, that they had orange basil sweet potatoes on sale for $1/lb (originally $5+/lb). I tried it and was intrigued. 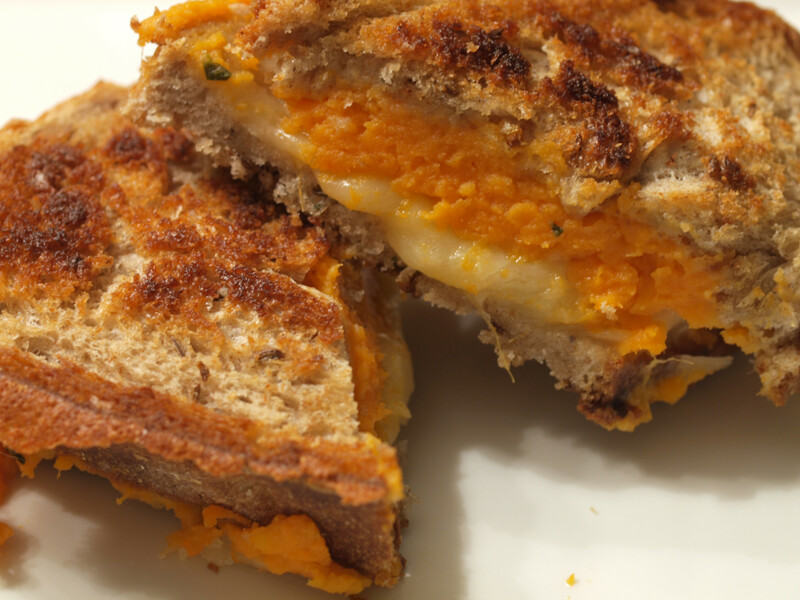 We had not yet used sweet potatoes on a grilled cheese so we went with it. I am sucker for the signs at Whole Foods that tell me something is “local.” (I purchased some yummy tortilla chips simply because they are from somewhere in Ohio. As I said, I am a sucker.) 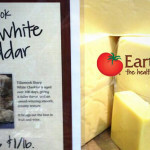 That is why I purchased this variety of Sharp White Cheddar from Middlefield, Ohio, as opposed to cheese from Vermont. Plus, the family drives to Middlefield on an irregular basis and I have never had a bad piece of cheese. Choosing local was a win-win. Whenever I choose to go with Cheddar, whether it be white or orange, I always try to go with sharp as I believe that mild is way too bland for my taste buds. The cheese just doesn’t have enough kick for me. This had a great smooth, creamy texture with that little bite that I enjoy in a good Cheddar cheese. The Amish know how to make a good cheese. 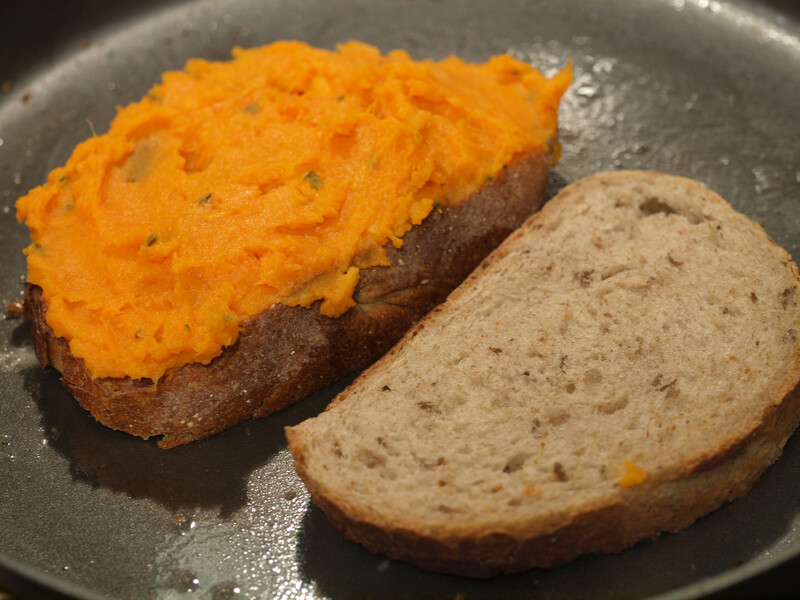 The orange basil sweet potatoes were something that caught my eye, even if not to use it on a grilled cheese sandwich. 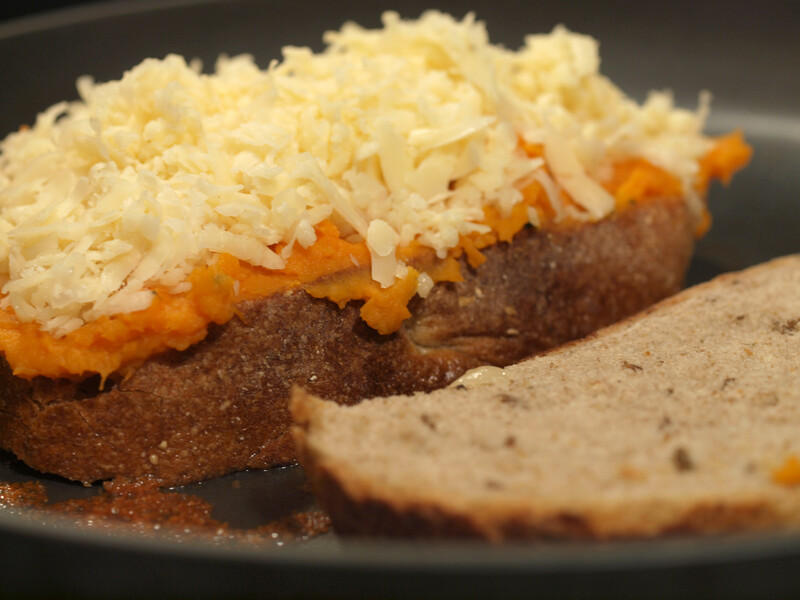 Once we thought about potatoes for a grilled cheese, the mashed sweet potatoes seemed like the perfect choice. Maybe next week we will try “regular” mashed potatoes. This vegan dish consists simply of sweet potatoes, orange juice concentrate, basil, and salt. The combination of potatoes and orange juice definitely created a very sweet combination. 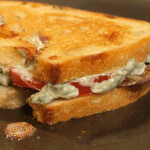 One, that at times, overpowered the grilled cheese. 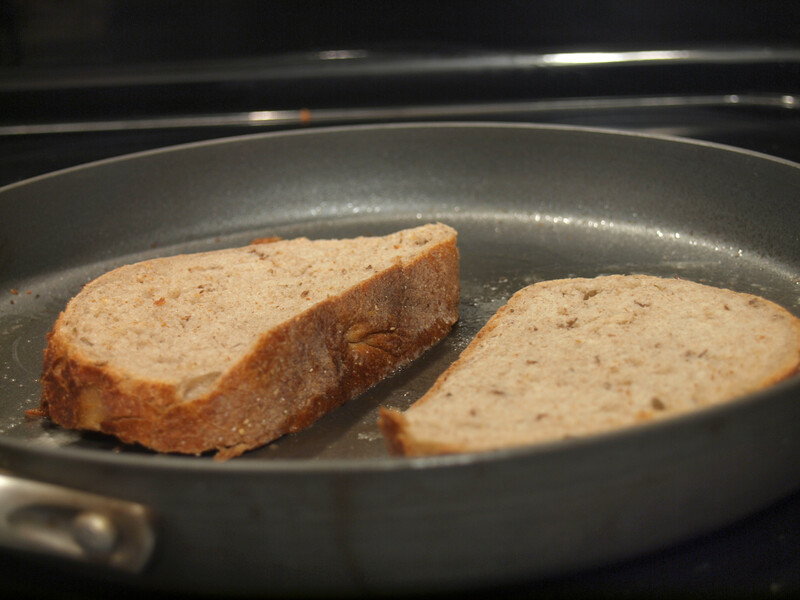 I was thinking about getting “seeduction bread” but ended up with a delicious Jewish seeded rye bread. It was nice and crunchy on the outside with a great, soft interior. It seemed to work perfectly in the grilled cheese. I will definitely be eating this bread by itself in the days to come. 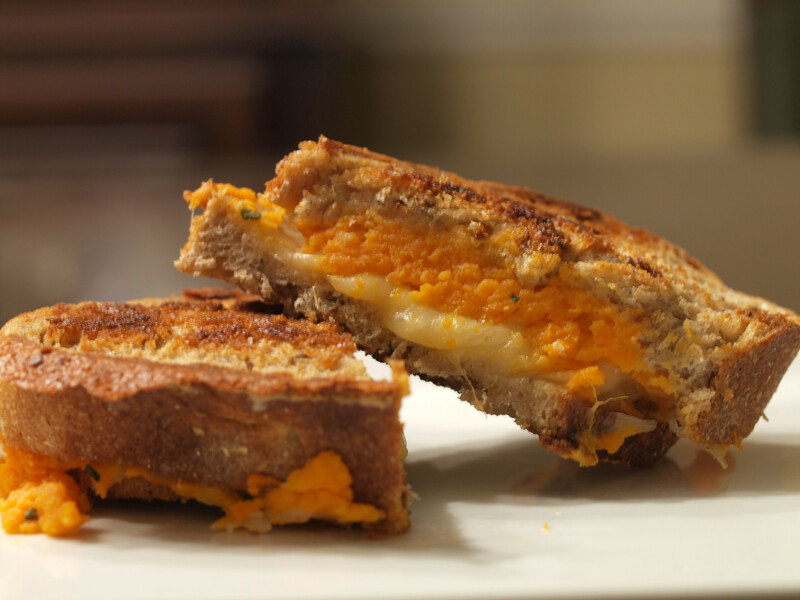 This grilled cheese was all about the sweet. Unfortunately, too much sweet. 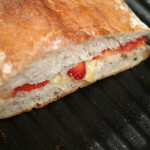 If I were to remake this sandwich, I would go lighter on the orange basil sweet potatoes and maybe add even more cheese. 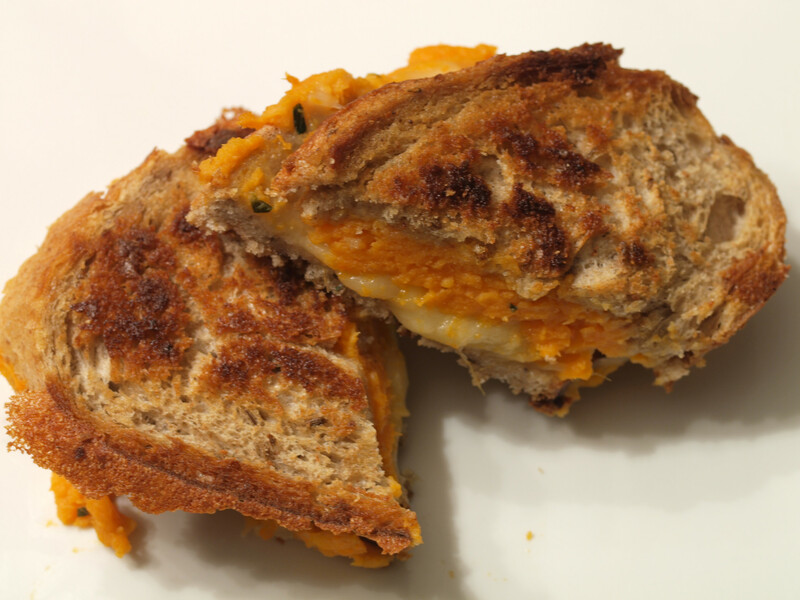 The grilled cheese was good and definitely different; the sweet potatoes were simply overpowering. 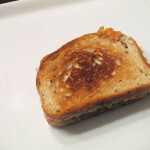 When I was able to get a nice sampling of the sweet potatoes, bread and cheese, the grilled cheese was very good, but those bites were few and far between. 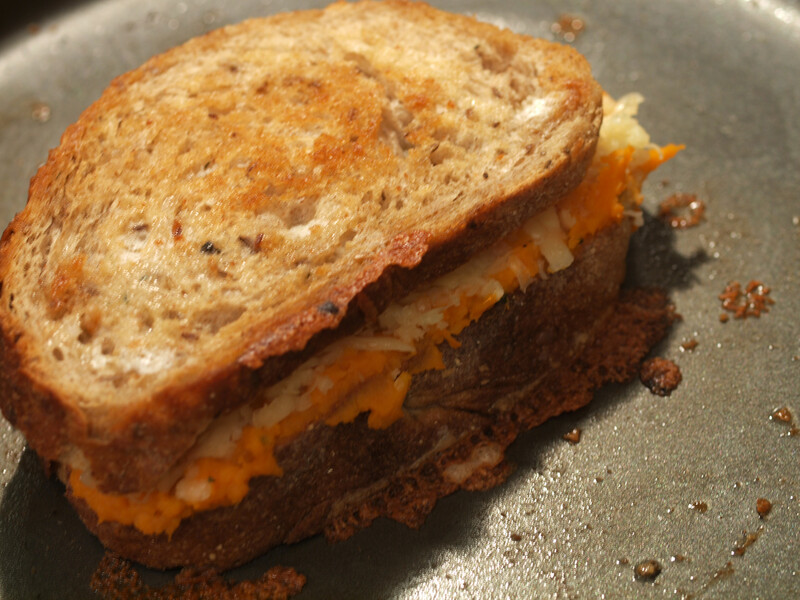 Posted in Grilled Cheese and tagged B Plus, basil, grilled, orange, potatoes, rye, sweet potatoes, white cheddar. wow,I didn’t know you could gather all these flavors in a grilled cheese sandwich.It looks wonderful and I bet it tastes delicious too.